WOW! Women On Writing Blog: End of Summer Mystery Book Giveaway! Since summer is nearing to a close, we thought you would enjoy two wonderful mysteries to cozy up to as we slip into the fall season and embrace the change of weather. If mysteries and thrillers are your cup of tea, this giveaway is for you! The Pigeon Pie Mystery by Julia Stuart (Doubleday, August 2012; hardcover, 336 pages) is a clever murder mystery set in Victorian England, brimming with fabulous characters and the signature charm she's displayed in her previous bestseller, The Tower, the Zoo and the Tortoise. This enchanting "whodunit" will turn your reading room into a lush English garden full of quirky whimsical characters. When Indian Princess Alexandrina is left penniless by the sudden death of her father, the Maharaja of Brindor, Queen Victoria grants her a grace-and-favor home in Hampton Court Palace. Though rumored to be haunted, Alexandrina and her lady's maid, Pooki, have no choice but to take the Queen up on her offer. Aside from the ghost sightings, Hampton Court doesn't seem so bad. The princess is soon befriended by three eccentric widows who invite her to a picnic with all the palace's inhabitants, for which Pooki bakes a pigeon pie. But when General-Major Bagshot dies after eating said pie, and the coroner finds traces of arsenic in his body, Pooki becomes the #1 suspect in a murder investigation. Princess Alexandrina isn't about to let her faithful servant hang. She begins an investigation of her own, and discovers that Hampton Court isn't such a safe place to live after all. With her trademark wit and charm, Julia Stuart introduces us to an outstanding cast of lovable oddballs, from the palace maze-keeper to the unconventional Lady Beatrice (who likes to dress up as a toucan—don't ask), as she guides us through the many delightful twists and turns in this fun and quirky murder mystery. Everyone is hiding a secret of the heart, and even Alexandrina may not realize when she's caught in a maze of love. 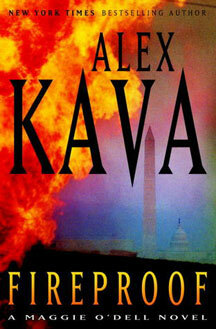 Fireproof by Alex Kava (Doubleday July 2012; hardcover, 320 pages) is completely different—a nail-biting thriller featuring FBI Special Agent Maggie O'Dell. If you haven't met Maggie yet, you are in for a treat. She's smart, down to earth, and she does whatever it takes to solve a case. New York Times bestselling author Lee Child says that she could be "Jack Reacher's long-lost twin." See if you agree! We are giving away first edition, hardcover copies of the books above, Fireproof (list price: $28.95) and The Pigeon Pie Mystery (list price: $24.95), to one lucky mystery reader. Just enter the Rafflecopter form below for a chance to win. Open to US and Canada. Read the Hunger Games Series and The Lucky One. Alex Kava is one fine mystery writer!! Plus, she's from Nebraska. :) Definitely want to read Fireproof! I read the Sisterhood series by Fern Michaels - all 20 of them! I read the Fifty Shades of Grey series. Thanks. The Hunger Games Trilogy, Garth Stein's The Art of Racing in the Rain, Dennis Lehane's Prayers for Rain. Love reading new works! I read MANY mysteries this summer - too many to list. Other types of books as well - biographies, general fiction, etc. I just finished the Hunger Games series. No mysteries or thrillers, just historical fiction, like, Mine is the Night by Liz Curtis Higgs. The new Jonathan Kellerman book was GREAT! 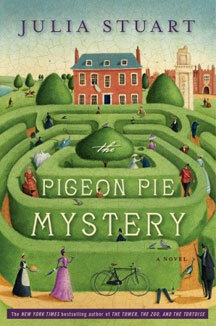 Hardcover copies of The Pigeon Pie Mystery by Julia Stuart and Fireproof by Alex Kava. What books did you read this summer? Any mysteries or thrillers? I Didn't Read Any Books This Summer. I Enjoy Reading Books In The Winter. Thanks For Having This Giveaway!!! I read The Red Tent and Blood Bones and Butter this summer. I read 11/22/63 by Stephen King. I read the Hunger Games trilogy and LOVED them! i read hunger games and 50 shades! I haven't read anything but I want to read the Hunger games! I reread the lord of the rings series and harry potter, and I read a bunch of nicolas sparks books! From Pullman.Thanks for the giveaway!! I read the Fifty Shades books.